This is it. This is the week when ACTA lives or dies, globally. We have seen it coming. Now is the time for the very final push in contacting the European Parliament. 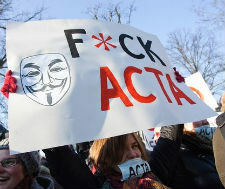 On Wednesday, in the session between 12 noon and 14:00, the European Parliament votes on ACTA. If the European Parliament kills it, it dies globally. There has been no shortage of ugly tricks, and they keep coming. The latest is a rumor that the pro-big-business and pro-monopoly EPP party group is going to try couping the ACTA vote off of this week’s agenda, postponing the vote indefinitely rather than risking a defeat. I say “coup” as the agenda is usually set in mutual understanding, and is not considered a place for political last-minute sniping if you can’t win your issue in the public and honest debate. The agenda is set in a small Europarl meeting tomorrow Monday at 17:00, before most Members of European Parliament (MEPs) have arrived to the weekly plenary session. It’s supposed to be a matter of formalities. But the good news is that all other parts of Parliament – and indeed even some parts of the EPP group – are listening to citizens. They’re seeing their inboxes fill up with mails urging them to reject ACTA, mails coming in from all over the world. And this is where we need to get working in a final gigantic effort in mailing the European Members of Parliament. That’s regardless of where in the world we live – ACTA is a global concern. It’s even quite the statement for an American or Brazilian to ask the Europarl to reject ACTA. I have taken the liberty of setting up a mail alias, [email protected], that resolves to all the official addresses of the 750-plus Members of European Parliament. This is your time to tell them why you don’t want ACTA, in polite, courteous, and personal words. It is not readily visible from the outside, but the street protests and concerned mails from citizens in Europe and elsewhere have made all the difference in turning the tide on this treaty that locks in the incumbents and shuts out the next generation. Every mail makes a difference. A mail a minute is a torrent. We know we can do better than that, we can do much better than that. Parliament individually to get them to postpone the vote. The responsible Commissioner Karel de Gucht even went on record that he’s going to be so furious with a Parliament that rejects ACTA, he’s going to keep it in the desk and present it again to the next Parliament in 2015 if it is rejected this week. This week, a half-decade of political trickery, sneakery and thievery comes to its end. Let’s indeed make sure it comes to an end. This is the political and business nobility against the rest of the people, against all of us. Fortunately, the European Parliament knows who to listen to when nobody else does – so we must make sure that ACTA doesn’t pass there. Just to give an impression of how desperate the monopoly proponents have become, one MEP in the EPP group – Marielle Gallo – has called the citizen protests “a soft form of terrorism”, and says that “the politicians should be doing the thinking for the citizens”. Did you mail the MEPs yet? What are you waiting for? The vote is on Wednesday at noon.